With the Olympics over, the ice rink at Brit is once again open for rec hockey. As much as I love sleep, I should take any hockey that is available. After all, with so much eating, I need exercise to balance it out. So tonight we resume our 11:30pm hockey on Wednesday night. Throughout the entire game, all I could think of was a nice hot bowl of Pho. Yah, it's not exactly uncommon for me to think of food, especially during a sporting event I'm directly involved in. It doesn't make for good performances... So my thoughts were to try out Pho English out on Broadway despite all the negative votes on Urbanspoon. Somehow, I must've misread the late night hours and assumed it applied to every day when it really was only for Fridays and Saturdays. Ah zut! Plan B. Wait, I had no plan B! That's when Polka King suggested we merely drive up Kingsway in search for late night eats. Sounds like a plan. Traveling East on 12th towards Kingsway, I noticed a restaurant open on Main called Tong's. It used to be another Chinese restaurant; but the name escapes me. I wasn't planning on turning left onto Main, especially in the right lane; however, at 1:30am in the morning, there is not much you cannot do with not a car in sight. When we walked in, there were a few diners scattered at various tables with not a server in sight. Seems like the entire staff (including the kitchen staff) were playing Mah Jong at a back table. Our presence seemed to have interrupted their game. We were quickly seated and since I was completely famished at this point, we decided to split a dinner for 3. Relax, I planned to take home leftovers for Viv since she didn't have a lunch for the next day. 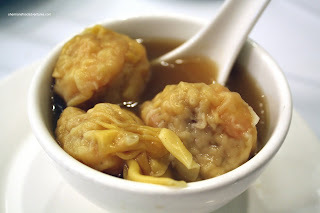 With the set dinners, there is a choice of soup (wonton, crea m of corn or hot and sour), choice of 3 dishes and spring rolls. Feeling adventurous, Polka King suggested we try the Wonton Soup. That MJ game must've been important because the food came out lightening fast and all at once. Everyone resumed their MJ game after that. The wonton soup was both good and bad. I really liked the whole shrimp; but the pork was a bit soft and basically ruined a good wonton. The soup was curiously dark, it tasted strange. 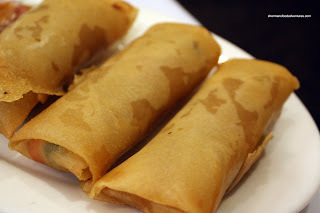 As for the Spring Rolls, they were crunchy spring rolls filled with veggies. They were a bit oily on the bottom. I thought the BBQ Pork and Shrimp fried Rice was done quite nicely. 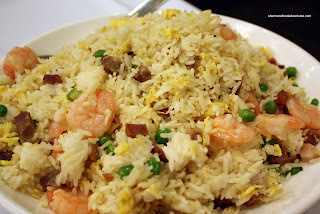 The rice was firm (albeit with a few clumps), shrimp was just cooked and pork not too fatty. However, I specifically asked for no green onions and it was ignored. I guess someone was going to "sic gai woo" in the MJ game... 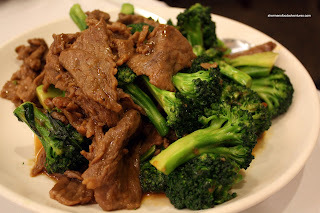 The Broccoli Beef was decent with crisp florets and tender beef. 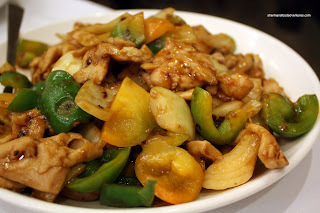 However, the Szechuan Chicken was a bust. I didn't realize that black bean sauce with a few chili flakes constituted Szechuan cooking. I know we shouldn't expect too much at 1:30am in the morning; but overall the food was mediocre. And in Vancouver, mediocre Chinese food doesn't cut it. Assuming you took some home for Viv's lunch, what were her thoughts? foodgasm, hmm. How about a top list of foodgasm places? I think she was indifferent. And indifference usually means that we won't necessarily eat it again. I think that's a nice way of saying "meh". LOL.. I believe the name of the previous restaurant was Ken's, but I might have that wrong. Ken's I did try and it was OK, don't think I will be going to Tong's. Thanks for the review!